Lost a Tooth? Get Dental Implants in Lynnfield, MA ASAP! Your wife had a great night planned for the two of you – dinner and dancing at Capone’s off 95, followed by your favorite dessert at home – a decadent Devil’s food cake she made for you from scratch. You polished off a tasty plate of lasagna and headed to the dance floor to enjoy your lady and the band. You were twisting and shouting when another dancer got a little overzealous and accidentally nailed you in the mouth. He apologized to you for his terrible dance moves, but it was too late. One of your teeth had been knocked out! Since it was a tooth on the side of your mouth, and it’s not very visible, you figure you can wait a while to have it taken care of. But, is this really the right move? Dr. Rob Schumacher, who provides quality dental implants in Lynnfield MA, advises against waiting. As Dr. Schumacher and the team at Schumacher Dental know, missing teeth are about more than just keeping up appearances. While having a great looking grin is important, it’s vital to understand the impact of missing teeth beyond aesthetics. The points below give examples of larger health problems caused by blank spots in your smile. Jawbone Loss – Aside from making your smile look fantastic, teeth also increase bone density in the jaw by putting pressure on it each time you bite down and chew. This pressure is good – it causes the jawbone to maintain its shape and bone density. When you lose teeth, (even just one) you stop the needed pressure, causing the bone to deteriorate. This can lead to difficulty speaking and appearance issues as the jaw shrinks away. The longer you wait for a dental implant, the more bone you stand to lose. TMJ – Since we just talked about bone loss in the jaw from missing teeth, it should come as no surprise that TMD, a painful disorder in the placement of the jaw, can be caused by missing teeth. As the jaw eventually wastes away from lack of bone stimulation, the alignment is affected. Clicking and popping, swelling, and pain can all come from TMD caused by waiting to get a dental implant to address a missing tooth. Painful Chewing – There is a reason you have teeth on the upper jaw and lower jaw – to chew properly. When you lose one tooth, its mate (either above or below) has nothing to make contact with to chew properly. This can cause the mate to make contact with the gum where the missing tooth is. Chewing food against gum can be painful and lead to infection. This pain can even lead to poor nutrition, all because of waiting to get a dental implant. Now that we’ve covered some of the problems that can be caused by waiting to get a dental implant, let’s talk about how dental implants, especially those done by Dr. Schumacher, can reclaim your smile. Aside from looking better (and younger), having no gaps your smile, you’ll be able to chew properly, and your bite can be properly aligned with a dental implant. If you’re missing a tooth, either congenitally or from an accident or injury, schedule your appointment with Schumacher Dental today and don’t wait a minute longer to work with your premier dentist in Lynnfield, MA. Comments Off on Lost a Tooth? 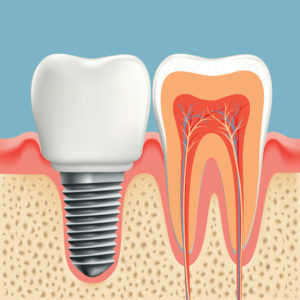 Get Dental Implants in Lynnfield, MA ASAP!